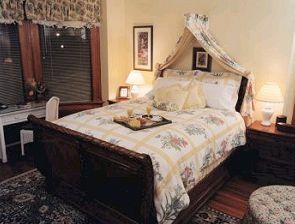 Fleur-de-Lys Mansion…Luxury Inn at the Park Bed and Breakfast St. Louis. Simply the best St. Louis has to offer!! This award-winning historic inn excels at ambiance, service and food. Antique furnishings, down comforters & pillows, beds you will wish you had at home, fireplaces, Jacuzzis, stunning architecture and a magical garden will delight your senses. The Mansion is an ideal place for business travelers looking for a world-class alternative to the traditional hotel. Only 3 miles from downtown and 15 minutes from Clayton. The Mansion has a sophisticated phone system with 2 telephones in every room, free local calls, programmable voice mail, dataports and even a WIFI hot spot. All rooms have an attached private bath, cable television, CD player and a comfortable work desk. Full concierge service, a conference room and AV equipment are available. Close to all major attractions. Off-street, gated parking. There is also a wonderful hot tub in 2nd floor solarium.